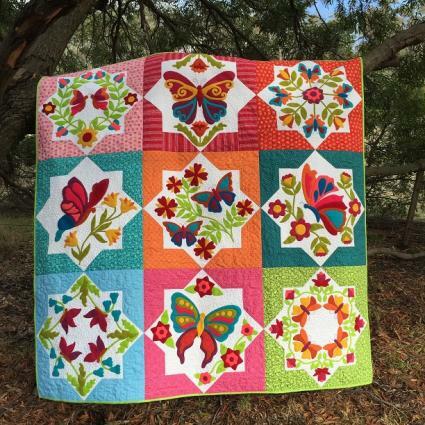 This stunning Block of the Month uses the pattern Borboleta, designed by Deirdre Bond-Abel of Hat Creek Quilts, and features bright wool applique'. Each month includes felted wool for the applique' pieces, fabrics for the block construction, and the pattern for that month's block. 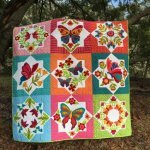 The blocks are 24" so the finished size of this quilt is 72"x72" and binding is included in the final month. Our block fabrics are different from the pattern picture, but are just as bright and fun! It is $ 45 per month for 9 months. Call us to sign up!